Modified GRF (Growth Releasing Factor) 1-29, sometimes referred to as CJC-1295 no DAC, is a synthetic GHRH (Growth Hormone Releasing Hormone). Naturally occurring GHRH has forty-four amino acids in its structure. Sermorelin, sometimes referred to as Modified GRF (1-29), has twenty nine amino acids in its structure. Unlike Sermorelin, four of the amino acids in the structure of Modified GRF (1-29) have been replaced in order to avoid oxidation and deterioration in the manufacturing and storage process. 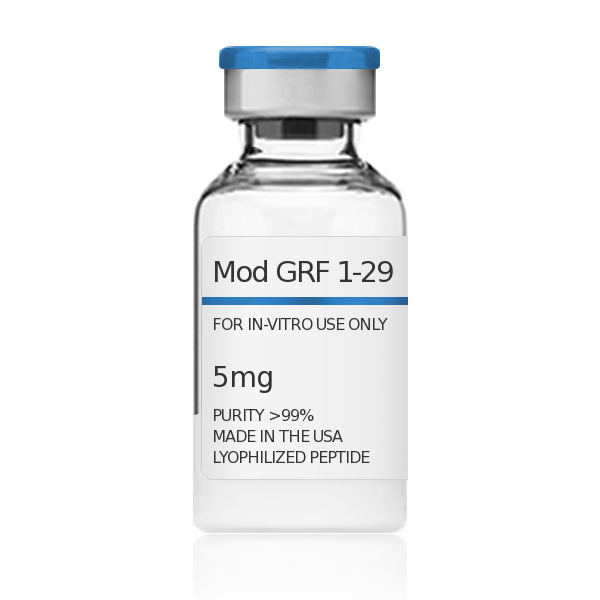 Additionally, the Modified GRF (1-29) will not metabolize rapidly in plasma. GHPeptides™ Modified GRF (1-29) has a peptide purity level that exceeds 99.0% as determined by HPLC. This peptide was synthesized with no additives and is supplied as a white lyophilized (freeze-dried) powder. It is recommended to reconstitute the lyophilized Modified GRF (1-29) in sterile water, which can then be further diluted in other aqueous solutions. Lyophilized Modified GRF (1-29) although stable at room temperature for 3-4 weeks, should be stored desiccated below -18°C. Upon reconstitution, Modified GRF (1-29) should be stored at 4°C out of direct light for between 10-14 days and for future use below -18°C. Prevent repeated freeze-thaw cycles.